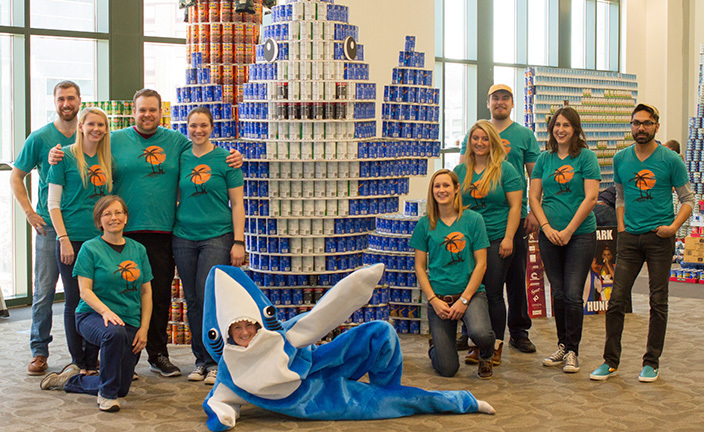 LLB Architects teamed with Shawmut Design & Construction to create Left Shark and his friends out of around 4,800 cans to support Canstruction and the Rhode Island Community Food Bank. The structure was inspired by a member of Katy Perry’s Super Bowl 2015 half time show; Left Shark. Along with his friends ‘beach ball’ and ‘palm tree’, they groove into the scene hip shaking out hunger one can at a time. The panel judging the competition selected the sculpture as the winner in the Structural Ingenuity category. It also won the People’s Choice Award through voting on the food bank’s Facebook page. Canstruction is a food charity organization that holds annual design and build competitions to construct fantastic, giant sized, structures made entirely out of canned food. They partner with the Rhode Island Community Food Bank, an organization providing food to people in need and promoting long-term solutions to the problem of hunger. RI Community Food Bank will receive a sizable donation of food from the event, estimated between 20,000 to 30,000 canned goods.